Are Cranberries Good For Your Teeth? Dr. Bruce has published a post about cranberries and other foods that are good for you teeth. You might want to consider joining the free dental health community while you are there. Sometimes it is great to learn new tips for dental health. Often times, they are things you already knew, but had forgotten. Therefore, it is great to have reminders. Dental health is very important. We generally get one set of adult teeth and we need to protect them along with the health of our gums as best we can. The pain of dental health problems is not fun! I think most, if not all, of us know that. The expense that comes with these problems is also know fun. The other day, someone told me they had $50,000 worth of implants. Wow! Prevention does pay. And we all know it. It is one of those little secrets that many of us have forgotten! It pays to refocus sometimes. Why Am I Sensitive To Most Toothpaste? This is actually not so unusual. Every human body is different. It's chemical makeup and reactions are different from the bodies of others. There are many people who have allergic or sensitivity reactions to all kinds of toothpaste. Sometimes, it pays to check out all of the alternatives available. Here is an unusual and unique approach that at least one dentist supports whole heartedly. I am not a dentist and don't give dental advice. Do your own research. Here is something else to consider: There is a mouthwash out there that has a lot of alcohol in it. This brand is very popular. Yet, it isn't the alcohol in it that makes it work. It's essential oils. It has essential oils of menthol and eucolyptus in it. But, are there better essential oils to use? Some say that there are. Moreover, is all that alcohol really necessary? We know that alcohol drys out the mucous membranes of the mouth. A dry mouth can lead to rapid bacteria reproduction. That can't be good, right? Sound off in the comments below - if you have anything to add or say. You can check with your specific health care plan, but it may be possible to obtain partial or full reimbursement for your Hydro Floss based on signed document by your dentist. It will have to list the diagnosis - most likely "Gingivitis". And "Treatment": Use your Hydro Floss 1-4 times daily for X amount of time. Have the doctor sign and date this letter with his name, address and telephone number. Then take this document and submit it to your health plan. Of course, your specific plan may have its own quirks, but it should be possible to obtain reimbursement. You can check back here. I might have a sample document available later this week or next week. Which State Ranks Worst In Dental Health? Well, I'm not sure the criteria used in this article are valid. This is particularly true because they didn't really carefully explain exactly WHAT those criteria were. But if you want to read the article and find out which state they are talking about, click here. What caught my attention though was a dentist they talked to that says she removes a 'full set' of decayed teeth at least once-per-month. That makes me sad. There may be some valid cases where there is no way to avoid this. But, for the most part, most people can avoid this end result with a little knowledge and understanding. One of the reasons cited for this state doing poorly was lack of dental insurance. I can't imagine the numbers they cited are too much worse for other states, given the ridiculous costs of health care in the US. But, I suspect, that proper home care of teeth would leave many more people with healthier teeth and gums and less need for costly treatments. I can't guarantee anything, but I bet one of these would do many families a great deal of good and ultimately save them money and pain. Of course, one should always go in for their regular checkups and cleanings. That's very important. But most dental professionals will acknowledge that what you do at home to take care of your dental health is the most important part in determining what your dental health ends up being. If you have not been already, please, please give a little more focus to your dental health and well-being. It affects so many aspects of your body's health. You are free to go to the above page to read the other comments there or to share your own views. As the moderator I must keep an impartial stance. You can also leave your comments about fluoride use here on this page, but I respectfully suggest that it would be better to leave them on the page found at the above link. I'm pretty sure you may have an opinion about fluoride, so I want to encourage you to leave a comment. A growing number of cities and towns are voting to remove the fluoride from their drinking supply. How do you feel about this issue? Are you pro-fluoride or anti-fluoride? The more rational and sound argument you can muster, the more likely you are to influence others on this topic. Here is a link to the fluoride commentary page. I invite you to go there and make yourself heard on this topic. I had a customer yesterday tell me that he is now 64 years old and he has needed his teeth straightened out since he was a teenager. He was told all kind of things by dental professionals. And he was quoted some, what he considered to be, ridiculous, fees for getting his teeth fixed.
" $64,000 " - That from a dentist who wanted to pull all of his teeth and give him implants.
" $32,00" - 'Bargain price" from the same dentist. This man told me that he decided to go to Mexico. He is very happy with his teeth now. The dentist there had a very clean, professional office and fixed his teeth for only $1,000 dollars. He had to make several trips down there. His travel costs were about $7,000. So, for $8,000 he got his teeth fixed in Mexico. This is what they call 'medical tourism' and it is happening more and more frequently. By the way, the dentist in Mexico was able to straighten his teeth out without pulling them all and installing implants. This man told me he was VERY happy with the results. He said that he 'wished he had done it sooner'. As the costs of dental / medical care becomes more and more out-of-line with what the average person can pay in the United States, more people will probably consider this type of option. Lorenzana dental associates is one such place. He was trained in the US. I can't recommend anyone I haven't personally used and I have not visited Dr. Lorenzana's office and I have NOT been treated by him. But, his website is very interesting. If you have had an experience with 'dental tourism' and would like to share your experiences, there is a comment section below. This same customer also really likes his Hydro Floss. 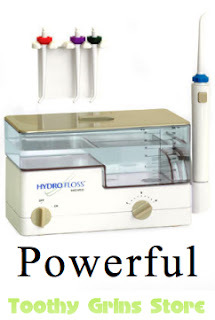 Do different hydro floss tips have different directions? Do You Really Have 8 Cavities? "I've got a creepy feeling about this Batman"
Ever get that creepy suspicious feeling when things seem a little 'odd' or 'off'? I do. I get it a lot. Sometimes honoring that feeling can really pay off. I mean as in saving real money. I don't remember when I first heard about this phenomenon with cavities, but it turns out to be accurate - verified by my own experience - and others' too. I have also talked to others that have had similar experiences. For example, I remember back in the late '90s a coworker told me a story about a dentist who told her she had 8 cavities. She went to another who said she didn't have any! For me, just a couple of years ago, I had an experience. But, it wasn't the first one. It's just one that still annoys me today. If I hadn't listened to my instincts, I might have ended up with a lot of expensive and unnecessary dental work. My periodontist noticed that I had a 'leaky' filling. 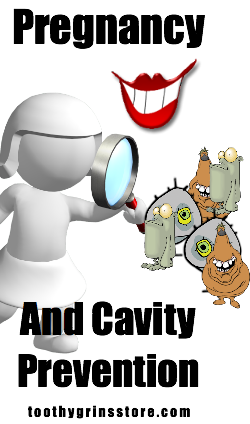 That's when a filling is starting to break down and their is the potential for particles to get trapped in or under there and perhaps a new cavity could even form. So, it should be replaced. Fillings are not really his thing after all. His specialty is periodontics. So, he referred me to another dentist. I went to the new dentist, sat down in the chair, and he examined me. Aside from the leaky filling tooth, which he suggested might need a crown, he found three 'cavities'. He had a nice fancy magnifying device to show me the dark spots which he claimed needed to be filled! Oh, and for the leaky filling tooth: That's the one he wouldn't know if it needed a crown or not until he 'got in there' How convenient that he had a fancy crown making machine right there in the office. LOL, my creepy feeling indicator was measuring high that day. When I left, the receptionist asked when I wanted to schedule an appointment to get all the work done. I said, no thanks and left. I found another dentist. No cavities that he could find! 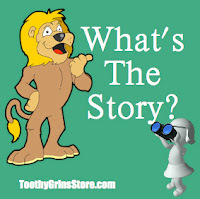 In addition, he was absolutely positive that the leaky filling tooth would NOT need a crown (and it didn't). At the end of the day, who knows how much money, pain and future dental expenses I saved myself by finding another dentist and getting a second opinion! I say future dental expenses because fillings break down and need to be replaced. Crowns can have problems too! We know I saved myself from at at least 3 unneeded fillings for sure. Fast forward several years, I have been to at least two other dentists since then. No mention of these three cavities from any of them! I've talked to a lot of people, I'm not the only person with such an experience. Some dentists are too eager to 'drill and fill'. You have the right to get a second opinion any time your 'creepy feeling' indicator goes off. (And you should get another opinion whenever the slightest doubt persists)! There are good dentists and bad. You are going to need to figure out how to sort them out if you don't want to spend a lot of money that you really didn't need to spend. Teeth can heal. The beginning stages of cavity formation can reverse before things get to the point of a true cavity. There is a point though, when it really is a cavity that should be filled. EX. A different dentist once told me that filling a 'sticky' spot was called 'preventive' dentistry. I denied her wish and went to another dentist who told me there was NO CAVITY there! I don't know about you, but I sure don't need to spend extra money and have unnecessary holes drilled into my teeth! Fillings may eventually need to be replaced. This can take a long time or it can take as little as seven years. Every time they 'replace' a filling, the hole is made bigger. You can only do that so many times and then the tooth structure cannot support itself any longer. - root canal and crown? If you have any doubts about any procedure or treatment - It often PAYS YOU to get a second opinion. The savings could be enormous. Sound off in the comment section below. Would love to hear other stories. I'm not picking on dentist here. There are good ones out there. You just have to be able to find differentiate the good ones from the bad. You should definitely go for regular checkups, get your teeth cleaned and don't avoid work that MUST be done. 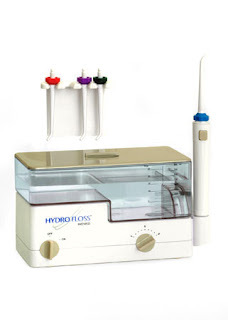 Interesting Links: Read About The Hydro Floss ( a tool I know that has had a positive impact on the dental health of many people). Consider the effect for those people who sip on coffee or soda all day long. Read more about coffee and your teeth. PS: If you are dental professional who would like to be listed on this site - read this. Read more about the pocket pal jet tips here. Logic: 'Bad' bacteria multiply faster when there is an acidic environment. Then they create more bacteria that secrete even more acid. This creates a self perpetuating loop. - Unless you stop it. Second - Acidic foods and drinks (like coffee) can directly harm your tooth enamel. This can potentially leave you open to cavities. Bad bacteria have a lot to do with gum disease, cavities and bad breath. Canker Sores Are No Fun! It seems like those pesky suckers have a mind of their own. And, they are not there to bring you a great deal of comfort are they? If you are suffering from this problem, you would probably like a little relief. Who could blame you. *if you need a coupon, try a-per10 for free shipping. Free Dental Health Service For Pregenant Women And Infants In Dundalk, Maryland. Looks like there is free dental care today in Dundalk, Maryland. Sounds like it is for today only. If you know anyone in that area, you might want to let them know. It appears to be sponsored by the Community College of Baltimore County. You can check the above link for times and the exact address. There are just too many people who don't have dental health insurance in the US! Unfortunately, many people try to avoid going to the dentist as a result of not having coverage. They either fear the expense or the pain or both. That's bad because regular dental cleanings could make a big difference. Perhaps one of the biggest threats to people is losing teeth over gum disease. I hope we can figure out a way to get more people regular cleanings and checkups in the US. Dry mouth is a threat to your dental health. The reasons are relatively simple. You mouth uses saliva to retard bacteria populations. In addition, dried out tissues are much more susceptible to bacterial growth. For these reasons, you should not take dry mouth lightly. The so called 'bad bacteria' are responsible for many dental health problems such as gum disease, cavities and bad breath. Many medications are the source of dry mouth as it is a side effect of quite a few. The best person to ask about this is your pharmacist. You can always ask your doctor if there is a replacement medicine that would be better suited for you. Of course, that may not always be possible. Only your doctor will be able to tell you. I speak in general terms only here. For specific questions about your own unique situation be sure to ask your doctor or dentist. Generally, you can use coupon a-per10 for any of these items for free shipping and free toothpaste. Dr. Sam Haase and fellow veterinarians Dr. Frederic Michaelson and Dr. Chris Hayes are running an Animal Hospital. Dr. Haase states that according to recent estimates 3 out of every four cats AND dogs over three years old have gum disease. What I find interesting is that this is similar to the estimate for humans too! Three out of four is 75% which is what many dental professionals believe is the number of people with at least some gum disease as well. So, we have three different species with about the same incidence of gum disease? Cats, dogs and humans all appear to have about the same incidence rate of gum disease! That's very interesting to say the least. 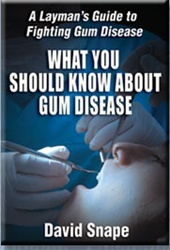 Understanding gum disease, for humans, is very important to their health. Researchers have found some type of connection, although they don't fully understand these connections, between gum disease and many other diseases in the body. Actually, this is only modern confirmation of what ancient people intuitively understood! Didn't (and don't they still today) farmers always check an animal's mouth before purchasing it? Why is that? They intuitively understood that an unhealthy mouth possibly or probably meant an unhealthy body. Isn't that where the saying, "Don't look a gift horse in the mouth", comes from? Learn what you can to help to protect yourself and your family today. This Katy, Texas website answers the question: Is gingivitis reversible? I do think they did a good job answering this question. If you have interesting commentary to add, let us know. We should not overlook, nor forget about prevention. Many expensive dental procedures could be avoided in the first place, if patient's were more educated about prevention. My favorite. PPS: prevention can also help a lot in reducing an individual's or family's health care costs. My favorite prevention tool. I've recently read that patients of the Tulsa Oklahoma oral surgeon accused of serious breaches in patient safety protocols have begun to be tested at a health clinic. The location of the clinic was not disclosed, but it appears that the information sent by State agency, directed the patients to be tested. Apparently, they were being tested for two forms of hepatitis plus the AIDS virus. I hope that the people will all checkout to be ok! Do not overlook / forget about dental health problem prevention as well. Many expensive dental procedures could be avoided in the first place, if patient's were more educated about prevention. My favorite. I thought this was a decent article on the question: Can I Reverse Gingivitis? from a Katy, Texas dentist's website. Nice thing about this article is that they even mention cranberry juice for its antibacterial properties. I believe they intended to say that it helps to keep bacteria from adhering to the teeth and tissues. Gingivitis is, of course, said to be the reversible form of gum disease. The article went on to remind us that when left untreated the disease will progress to lost gum tissue and eventually lost teeth. Aside from the exceptional cranberry juice mention, we received the standard advice about brushing and flossing 2-3 times per day. However, with such a high incidence of gum disease in the world, we have to question whether JUST brushing and flossing is enough. The one thing I would like to add to that information, which would actually be helpful to people, is the generally objective measurement of gum health called - periodontal pocket depths. It would be absolutely fantastic to let people know that those measurements are important and why. Of course, that would mean - gulp - empowering patients to make - gasp - their own choices. NOT really! But, it does help patient's understand what they need to do to improve their dental health and a way to measure their results. Without such an understanding, it is really hard to just follow advice. Give someone a goal to go after and LOOK out! Of course, that is not true of everyone, but I think it would be helpful to a lot of people! You do still need your dentist or hygienist to actually measure those depths - so it is not like people will stop visiting their dentist. I think many people actually enjoy getting their teeth cleaned. I know I do! Thanks to Noble Smile Dentistry for writing a helpful article on dental health. Should US Schools Provide Dental Care To Students? 1. Children with dental health issues are 12 time more likely to miss class due to a dental health issue than students with great dental care. 2. Children with poor dental health care are 4 times more likely to get lower grades! This article focuses on the State of California. There even appears to be a state mandated program for dental health screenings. But, there is no funding for the programs, so they are overlooked - apparently. Their seems to be some underlying assumptions or expectations as well. Should students be given dental care as part of the regular school program? I bet a lot of parents would be happy about that! The burden of costs for such programs would likely be very high and California is already having a hard time keeping everything going with their education programs - as is the rest of the country. Where is the balance between ever increasing expectations of things for free and how much tax payers must shell out? Seems to me we already have financial issues in this country. Are we going to make them worse? On the other hand, who would be willing to stand up and say they are against what amounts to 'universal dental care' for school aged students? Medi-Cal appears to be California's attempt to provide affordable dental care to poor children and it sounds like it has been dubbed a failure. They are having a hard time getting enough dental health providers to accept Medi-Cal students because the program doesn't pay enough. This brings up an interesting point. Government programs are very costly. Even when in place, it appears that children are still having trouble getting adequate care. Is it possible for family's and individuals to increase their odds of preventing costly dental health procedures? Such a possibility could potentially relieve the burden on such programs and protect the students themselves. Share your thoughts and comments in the comment section below. Do not overlook / forget about dental health problem prevention. Many expensive dental procedures could be avoided in the first place, if individuals and families were more educated about prevention. My favorite.